Abundant life. Does that describe the life you're living now? Or do words like busy, overwhelming, disappointing, or exhausting come to mind instead? Today, more than ever, we long for satisfaction in our lives and fulfillment in our faith but come up empty. We are lacking, and that hole can't be filled by money, prestige, or stuff. However, God had so much more for him. Pastor Choco rose to become senior pastor of New Life Covenant Church (one of Chicago's fastest-growing churches) and one of TIME magazine's 100 Most Influential People in the World. 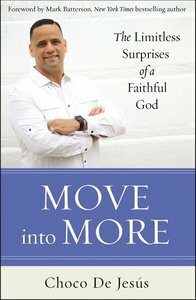 In Move into More, with conviction and earnestness, Pastor Choco explains that God has promised a life of more--joyful contentment that comes from living passionately with a purpose--to anyone who follows him in obedience. It's not who you are, he says, it's what Jesus can do if you will let him. Choco breaks down popular-yet-untrue thinking that God's "more" is about wealth or material possessions, fame or power, and shows readers that God's more is far better than anyone could ever imagine. Don't settle for less than God has for you--it's time to Move into More!